Now Zechariah was chosen by lot to enter the inner sanctuary of the temple to burn incense. As he was ministering before the LORD, an angle appeared standing to the right side of the altar of incense. 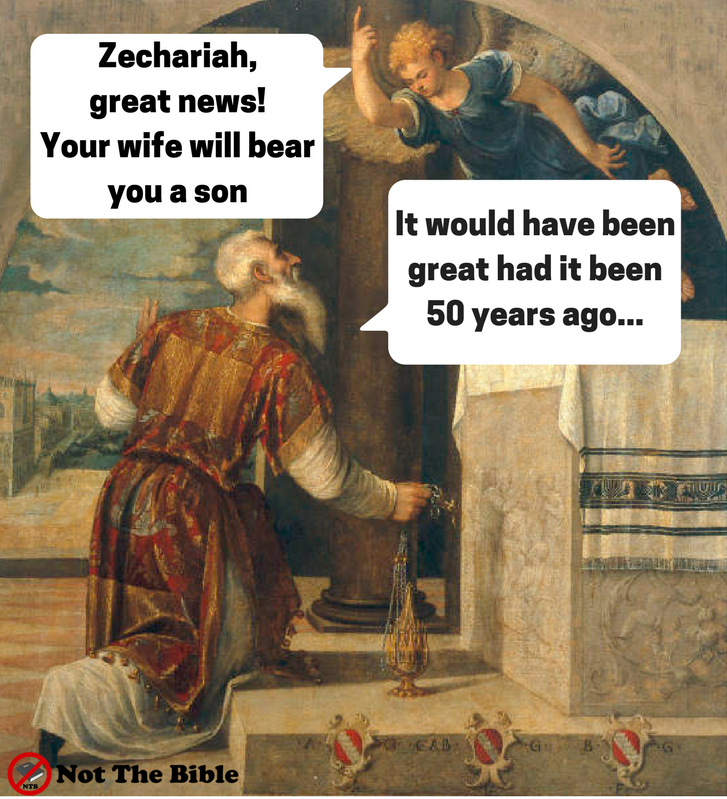 When Zechariah saw the angle it unleashed the pent up frustration of years of unanswered prayers. OK, we don’t know how many years but we know people married typically in their teens. 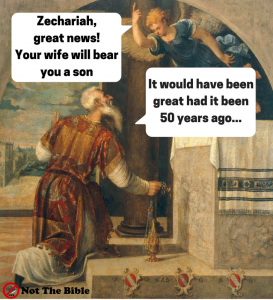 The text says that they were “well on in years” and Zechariah’s questioning indicates Elizabeth is well past menopause. Despite all those years how did he not react in anger? Especially when fruitfulness was seen a sign of blessing and barrenness a sign of God’s curse. What is the point of being obedient when you’re cursed anyway? How unfair – when others who are disobedient seem to get pregnant straight away! OK, we know the story didn’t go that way – but it would take a special person to not get cross for the years of no answers. Now my wife and I have only experienced infertility for three years before God totally healed her. So we didn’t experience much disappointment and anger. But when my wife was being bullied at work THEN I had major anger. I wanted to go in and give the bully a piece of my mind. But I knew I was out-of-control. However, the danger to Christians is we realise that our expressing our anger may be wrong and so we suppress it. This doesn’t deal with it – it just makes it come out in other ways. The key I found was expressing it to the Father and slowly but surely he drained it out of me until it was replaced by passionate prayer for this woman who was bullying out of her brokenness. Or is it that instead of anger, he had simply resigned himself to the fact that nothing is going to change. God has said no and he has made peace with that – but has he in his heart lost all hope and faith of something different happening. My wife has become increasingly disabled due to a debilitating condition. We have prayed and sought prayer but it’s just got worse. Now we are experiencing God in this darkness but I wonder whether we have also just secretly assumed that this is it? May we never lose sight of the God who can do the impossible. And while we’re here – let’s ask the question: why did God make them wait? Was God toying with them? Was He uncaring? Or was it preparation for the task ahead? Their faithfulness in their time of unanswered prayers has made them ideal parents to bring up a son who will stand up despite great opposition. We can also see that because of their faithfulness they have been rewarded with this special privilege.